Some people with allergies should consider immunotherapy in the form of allergy shots. This year was different. On the way to his baseball league's opening celebration in Stow, Massachusetts, the second-grader started crying so hard his mother was afraid he'd have a panic attack after pollen blew into his eyes through open car windows. "His eyes were just burning; they were really red," says his mother, Julie Glovin. Luckily, the family ran into a friend whose son also had seasonal allergies, who recommended antihistamine eye drops for Jack. "Within a minute, he was much better," Glovin says. Now he's taking Zyrtec for kids, and so far is doing well. Just as spring is the time for getting outside to enjoy blooming flowers and baseball pitches, it's also a time of misery for allergy sufferers. This year, some parts of the country are reporting a worse-than-usual allergy season--although your symptoms depend on where you live, experts say. Although predicting allergy season can be tougher than predicting the weather, people who are allergic to spring pollinators such as trees and grasses now have many ways to find out what pollen levels are on a particular day. You can check your local newspaper or visit Web sites such as pollen.com for local pollen counts, which lists the day's five worst cities and five best cities for pollen (Good? Miami. Bad? Muskegon, Michigan.) At pollen.com you can even plug in your ZIP code to see a 30-day history of pollen counts or get a four-day allergy forecast. Also check out this Forbes article for the top 100 cities for pollen in 2008. But your itchy eyes, nose, and ears probably can give you your own personal pollen update. Most scientists do agree that there's been a warming trend over the past 10 years that appears to be pushing the start of spring allergy season earlier in certain parts of the country; unfortunately, this doesn't mean it will end earlier. Over-the-counter products such as oral antihistamines and eye drops are a good first-line approach for people with mild allergies, says Dr. Stephen Canfield, an allergist at Columbia University Medical Center in New York City. But if these don't help--and you don't exactly know what's triggering your symptoms--it's best to see an allergist, he says. There are many people with spring allergies who seem to react to just about everything else too--weeds such as goldenrod that pollinate in late summer and fall, and pet dander and mold all year round. "They basically don't get much respite," Dr. Canfield says. Health.com: What is exercise-induced asthma? If this is the case, you may need prescription antihistamines and nasal sprays, which shrink swollen tissue, as well as corticosteroid nasal sprays, which fight the underlying inflammation. The only way to fight allergies at the source is immunotherapy, popularly known as allergy shots. This involves getting shots of tiny amounts of the allergen in escalating doses, usually once a week, until you reach the maintenance phase, when you'll need one shot every month. Although it takes three to four years for the shots to reach their full effect, after which the dose is tapered down and eventually stopped, people often experience relief within a couple of months after beginning allergy shots. "It seems to be effective for about 80 percent of people who go through it," Dr. Canfield says. "It reduces their symptoms, it reduces their medication needs, and occasionally it allows them to go off medication altogether." The benefits can last for many years, but aren't permanent. Many people who had immunotherapy in childhood begin experiencing symptoms again in their 30s or 40s, he says. Another potential benefit of immunotherapy is that if it's given early enough, it may prevent children with an allergy or two from developing many more, according to Dr. Canfield. Although nearly everyone should consider immunotherapy, Dr. Canfield says, it's not for everyone. For one thing, the time commitment is major, especially at the beginning of treatment. For another, a weekly injection isn't something most people look forward to. 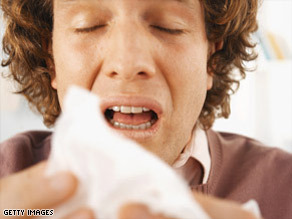 There are several common-sense measures that can help ease the misery of seasonal allergies. • Use an air conditioner to filter the air. Even just using the fan in an AC unit can help keep pollen out of your house. • Try to avoid peak pollen times. Avoid outdoor activities in the early morning and late afternoon, which are peak pollen times; if you want to exercise outside, do so in mid-day. The best time is between noon and 2 p.m., Dr. Canfield says. • Take a shower. Washing your hair and bathing before bed can help clean pollen off of your skin and hair, so you won't be carrying pollen to bed with you. • Wash the sheets and pillowcases weekly. This is a good way to rid your environment of pollen, as well as dust mites, which can also trigger allergy symptoms year round.